The new YouTube InVideo ad format is big news not because the format is new — Google has been testing the format for a while, and other sites like VideoEgg have used it. It’s big news because the ad format is being rolled out on YouTube’s massively scaled video site — kind of reminiscent of Google rolling out AdWords on its massively scaled search site. The InVideo ad format appears as a teaser overlay at the bottom of the video 15 seconds in. 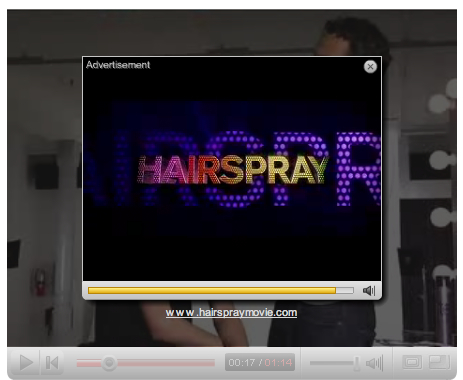 You can click the teaser to view the video ad in a smaller pop-up viewer, then go right back to your video. You can see the ad for yourself here (hopefully it’s still there when you try it). The InVideo ad format is undoubtedly less annoying than pre-roll videos — and that’s a considerable achievement. But it’s nowhere near the kind of breakthrough that search advertising was. Not being interruptive is the very LEAST that online advertising needs to do in order to thrive — what it really needs to do is be RELEVANT. The beauty of search advertising is that the format and the relevancy of the ad are PERFECTLY aligned with that of the “editorial” content, through the miracle of search keywords. That will surely be the case in some instances of InVideo ads, but in many if not most instances, the ads will have nothing to do with the editorial content — and the relevancy to any individual viewer, unlike keyword targeted search ads, will be hit or miss. And there’s a BIG problem with low relevancy — advertisers only pay if someone views the ads. Video advertising, with nearly $70 billion still trapped in traditional TV ads, is about to cross the Rubicon into the land of pay-for-performance. In the traditional TV ad model, it was opt out, i.e. you had to change channels, get up to get a snack or go to the bathroom in order to avoid the ad. Now, it’s opt IN. And now we’re going to find out what people REALLY think of video ads, which Madison Avenue has always known in its heart but has never been able to admit. We can expect a new cottage industry to emerge — the art of designing YouTube InVideo teasers. The glass half full approach will be optimizing the teasers to draw user interest and get them to view the video ad. The glass half empty approach will be optimizing the teasers to act as FREE advertising, which is what they will be if no one clicks. The assumption is that the $70 billion being spent on traditional TV ads will soon come flooding into online video. The problem with that assumption is that advertisers are about get, for the first time, real data on whether video ads “work.” If the data shows that nobody is clicking, will advertisers continue to dump money into the format? I think it’s true that a video ad has the power to connect with people at a visual and emotional level that’s simply not possible with a text ad. But the beta is MUCH higher — it’s also possible to annoy people with video ads in a way that’s simply not possible with an innocent text ad. The BIG question, of course, is whether YouTube InVideo ads will scale like Google AdWords. Henry Blodget has best and worst case scenarios. If InVideo advertising does scale it may be more a reflection of advertiser inertia than AdWords-like value creation for consumers. I observed the other day that it’s easier for advertisers to create value for online consumers with information than with entertainment. We’re about to find out whether that’s true.